Internet companies will get 100% rates relief from the Scottish Government to install fibre broadband across Scotland. The non-domestic rates relief is to encourage telecommunication firms to increase the availability of high-speed internet for Scots. The tax incentive will be introduced from April 1 and last 10 years, five more than the UK Government’s offer to broadband providers. Connectivity minister Paul Wheelhouse visited a CityFibre excavation in Stirling to announce the rates relief and see some of the work already under way to enhance Scotland’s digital infrastructure. Mr Wheelhouse said: “We have been listening to industry on what will help them play their part in delivering our ambitions and are determined that Scotland continues to be at the forefront of the digital revolution. “Infrastructure and connectivity are fundamental to creating digitally-enabled growth in our economy, so I am delighted to announce that from April 1, we will provide non-domestic rates relief on all newly laid fibre. “This significant commitment will help create long-term skilled jobs and make Scotland the best place to invest in digital infrastructure in the UK. 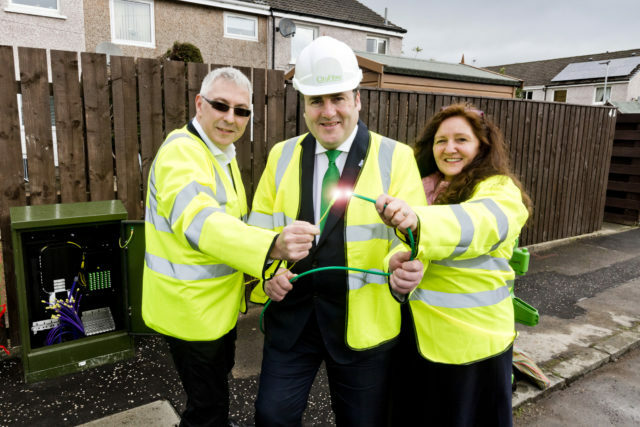 “Full fibre investment projects like CityFibre’s in Stirling complement the Scottish Government’s target of ensuring access to a minimum of superfast broadband for each and every premises in Scotland. “Despite telecoms being a reserved matter, we will build on the success of the £400 million Digital Scotland Superfast Broadband programme, investing a further £600 million to ensure Scotland is at the forefront of digital connectivity through our Reaching 100% or R100 programme. Elaine Doherty, city development manager for CityFibre in Stirling, added: “This announcement by the Scottish Government demonstrates its support for full fibre, as well as its commitment to supporting us as we deliver state-of-the-art networks at scale.